Haji Ali Mosque is a tomb at some 300 meters inside the Arabian sea connected to worli location of Mumbai and is a standing architecture in the name of saint ‘Peer Haji Ali Shah Bukhari (Also known as Hazrat Haji Ali)’ who was a Muslim sufi saint. Built in 1431 by in the name of a saint ‘Hazrat Haji Ali’ as the place named, Its a old monument structure in Mumbai and a Holy place of worship for Muslims. This Shrine is located inside Arabian Sea which is covered from around all side, Mesmerizing right ?. With that date built, What technology, science and thought went inside the person who built it with confidence and faith that it will not be disrupted by any natural calamities even when the rainfall is on its peak and high tides are scary. Till date with highest rainfall in place, the few metres broad walk way that reaches within sea to Shrine gets submerged, But never a day the Sea water damaged any corner of this Dargah. And today as the Shivaji memorial inside Sea project, needs so many safety clearance. Haji Ali looks very beautiful in monsoon seasons (MUST SEE THE VIDEOS BELOW). It is said that every week around 80,000 people visits this Holy Dargah of Mumbai and major crowd can be found on Sundays. 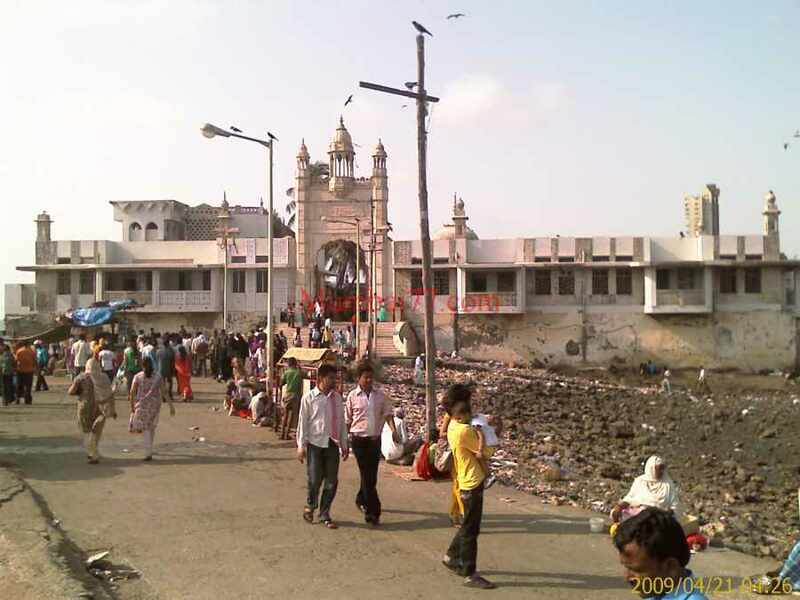 One need to walk from the main road (Haji Ali Junction) till the main Dargah at distance of about 350 meters on a foot that too on a 3 to 5 metre wide concrete path way which do not have any safety on side. By Rail : As said, Haji Ali is inside the sea and nearest railway station to reach being Mumbai Central and Mahalaxmi on Western Railway. This Shrine is connected to Worli so you can reach from any locations near Worli too. By Road : Point Your Navigator towards Mumbai Central, Tardeo or Directly Haji Ali Dargah. Mahalakshmi temple, Priyadarshini Park, Heera Panna Shopping center for electronics, Cross roads shopping mall, Atria mall worli, US embassy, Pedder Road, Napense Road for shopping etc.